The Airpura F600DLX was specifically designed for higher levels of formaldehyde adsorption. 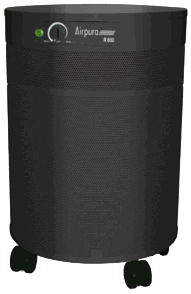 It features multi-stage filtration including a vacuumable pre-filter, 2 micro-suppress filters to reducing fouling of the carbon bed, a 26 pound enhanced activated carbon filter, and a true HEPA filter. The HEPA filter traps 99.97% of particles .3 microns and larger, and roughly 95% of particles down to 0.1 microns, making it ideal for the removal of dust, pet dander, dust mites, pollen, mold spores, and other common particulate contaminants. The enhanced carbon filter removes more than 250 chemicals, gases, and fumes, with enchanced abilities for formaldehyde adsorption. Like all Airpura air cleaners, the F600DLX is equipped with a 560 cubic foot per minute variable-speed fan with a one-piece assembly to reduce vibration and noise, felt gaskets to prevent contaminant bypass (many competitors use rubber seals that off-gas VOCs), and an attractive powder-coated steel mesh housing with 360 degree intake. Recommended Application: The Airpura F600DLX is an excellent choice for homeowners seeking high capacity medical-grade filtration for removal of formaldehyde from renovation, construction, furniture, carpets. It is also an excellent choice for removing pesticides tracked in from outdoors, and benezene / toulene from heating fuels, paints, and glues. Airpura F600DLX is backed by an impressive manufacturer's 5 year parts replacement, and 10 year labor repair warranty.